Are you a dog lover? Do you enjoy dog books? Meet Lord Banjo. 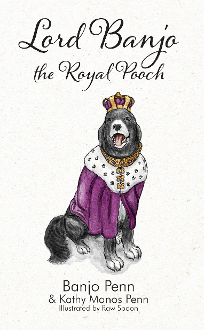 From humble family dog to Royal Pooch, what a difference a doggie DNA test makes. When Banjo discovers he’s descended from royalty, he knows he’s destined to rule. With gentle barks and a touch of the royal paw, he informs his mum that her highest priority is to help him tell his story. The short chapters and sweet illustrations in this tale of a lovable, huggable dog will appeal to adults and children alike. You’ll laugh out loud as Lord Banjo describes his adventures with the Royal Mum and Dad and the Royal Critter Sitter. You’ll meet Puddin’ the cat and learn what she thinks about her brother’s royal status. Dog lovers of all ages will appreciate Lord Banjo’s antics, and if you’re a pet parent, his behavior will seem strangely familiar. Have you ever wondered what your dogs and cats are thinking? Find out when you read this humorous book, destined to become one of your favorites.